I am notorious for my obsessive photo-taking while on vacation (and any other time), and loyal to my fame I took dozens of photos in Portugal. OK, more like a dozen hundred of them, and then some. And maybe a bit more. Don't give me this look! All those white washed houses, the laundry, the people sitting on benches, the tiles, the mosaic on the streets, the people, ahhhh the people! I had to document it, didn't I? The down side of such an overwhelming amount of photos is that when I approach this stash in desire to paint from them, um... what do I paint first? So, since I was grounded at home wallowing in viruses and tea cups, I strolled through the photos trying to pick one.
. . . Or ten. 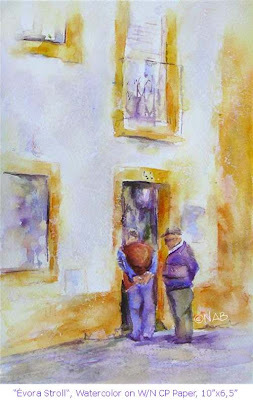 Now, when it comes to painting Portugal, you cannot avoid painting some architectural elements, which I absolutely dread, to say the least. Y'see, I do figurative work; people, figures, faces, hands - all made of glorious curves and odd shapes and lost edges and beautiful flowing rounded surfaces. Architecture has straight lines. That is, linear, and as The JohnnyB would happily attest (with a deep, deep sigh) - I am not a linear person. So how can I paint linearly? And yet, should one just stay in one's comfort zone forever and not travel at all to other domains, as challenging as may be? I decided to start simple. My first candidate was a photo I took in Évora, a wonderful bustling town about 2 hours east of Lisbon. This town has an impressive main square (Praça do Giraldo) with a mighty church (Igreja de Santo Antão) and a 1570 Renaissance fountain (fonte Henriquina) with eight jets that represent the eight streets leading into the square (al uphill, as our sore muscles soon found out...). Hmm, now that I am shamelessly using Wikipedia to show off with all that knowledge I did not have while in Évora, I also see that this square has witnessed thousands of Auto de fes during the period of the Inquisition; 22.000 condemnations, it seems, in about 200 years. OK then... maybe it's a good think I did not paint this square. But I digress (told you I'm not linear!). So, instead of all this glory, I chose to paint a humble mundane scene that I took on one of the streets while I was walking and getting hopelessly lost (Oh but what a town to get lost in). I started it at 5pm yesterday (very early for me, as I usually begin painting when normal people go to sleep), and was done several hours later. Being so different than what I usually paint, I was actually having a ball, until it reached the stage when it looked terrible. But rather than give up, I remembered that while diamonds may be a girl's best friends, a girl who's a painter can find a true kinship with (watercolor police, please turn your heads away, just this time) white gesso and the magic sponge, which I used to cover some lame areas and add some texture to the whole thing. Architecture is kinda fun to do! But before I tackle it again, I feel a deep urge to do a portrait in order to relax in my comfort zone. BRAVA!!! You not only stepped far from your comfort zone with architecture, you made it a very appealing painting. I wonder...what are those men looking at inside that doorway? Just stopping to chat with a friend? Perhaps checking on the wonderful smells of food cooking coming from within? I like this a lot - it's not a traditional (and sometimes boring) architectural painting. I really enjoyed looking at architecture through your eyes. The colors are delightful and your story telling is so much fun to read. I loved this architecture painting, very pleasing to me. I don't think you used harsh lines at all, to me you captured the essence of old world charm quite well. And this picture does peak my curiosity to find out what the men standing there were doing, which pulls you into the scene. Nicely done! Hi, Nava: I love to see your flowing fluid style used in the portrayal of walls and streets - you clever little artist you!! A lovely little view. Vicki, I try to do the story telling via words and painting - glad I succeeded this time. Jacquie, "old world charm" - you've nailed it! I think that's what captured me in Portugal. Valerie, hmm, so even when I do linear subjects my "flowing fluid style" still comes through? OK then, I won't fight it. Nava, Wonderful! I love the colors and can't wait to see the texture up close. Being not an art critic or understanding "capturing" anything but gophers in my garden - I think this is a wonderful painting. I will take a shot at the art part - I love the way the white space draws your eyes down to the enjoyable conversation these men are having. I truly understand the pace life here from looking at this painting - it is a pace I someday hope to live on a daily basis. Lorraine, nice shot at the art part, and you got the pace of life that was enviable. Good luck with them gophers. Rhonda, I also loved that purple tummy fella - all that good Portuguese food does take its toll, apparently. A nice travel memory painting. I take tons of photos imagining all the fine paintings which I never do and soon forget where the photos are or that I even traveled. I love the way you work with watercolor no matter what the subject. I laughed at the watercolor police line. Whatever works! And this works!